They go by many different names—sneakers, trainers, kicks—we all sport a pair every now and then. But most of us would never consider what just one pair of shoes can do. When senior Brandon McLaughlin isn’t in class or setting up double blocks for the men’s volleyball team, he is working as a campus representative for TOMS shoes and runs the TOMS @ Mason chapter. TOMS shoes has a very simple business plan: one for one. For every pair of shoes sold, one pair goes to a child in need. Blake Mycoskie, founder of TOMS shoes, came up with this simple business plan on a three-week excursion in Argentina. Since its start in 2006, TOMS has given over 140,000 pairs of shoes to children in need and plans to give 300,000 this year. Watch the video of the barefoot walk sponsored by TOMS shoes on campus. McLaughlin hails from southern California, near Santa Monica, which is where TOMS is based. The shoes are worn by household names from Kristen Stewart to Lindsey Lohan and Bono to Brad Pitt. So why get in on the movement? A pair of TOMS shoes. TOMS shoes offers a variety of ways to get involved, and becoming a campus representative is just one of them. So far, McLaughlin showed the TOMS shoes documentary, For Tomorrow in conjunction with Amnesty International last month. On April 16, he will be hosting “Day Without Shoes” encouraging anyone who wants to get involved to leave the shoes at home for the entire day as well as join in on a barefoot walk around Patriot Circle. Next week on April 29, the “Style Your Sole” event allows for some creative customization of white canvas TOMS in the quad between Fenwick Library and Student Union Building I. However, getting started hasn’t been easy. “Initially, one of my first problems was the ability to advertise, so for that I needed to get a sponsor. I sent out tons of e-mails, and I got an e-mail back from a fraternity, Alpha Phi Omega, and they’ve been really helpful. It’s a service fraternity and I think they have around 50 members, and they’ve been all really supportive,” said McLaughlin. 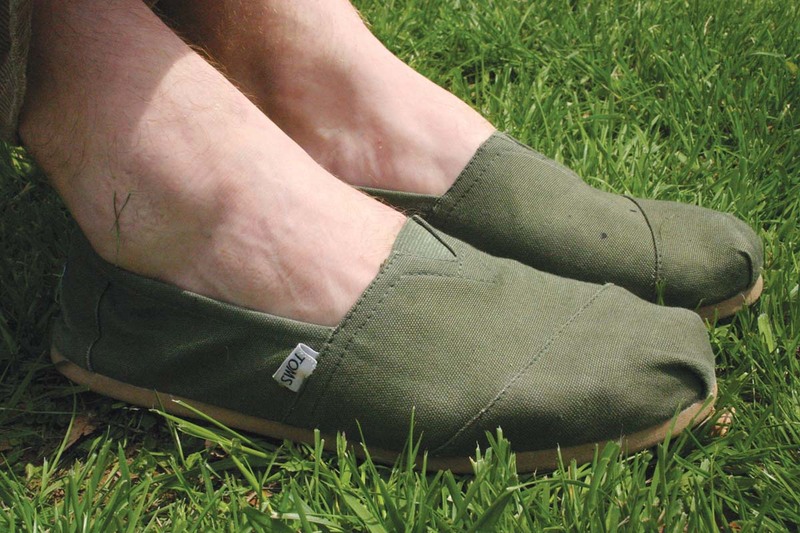 Our shoe-gooder’s senior status begs the question of what’s next for TOMS @ Mason? “Maybe create a legitimate organization on campus would be my goal. I think that’s the next thing I’m going to look into. I think it would be a good way to sustain the movement,” said McLaughlin. Find TOMS @ Mason by searching “TOMS @ Mason” on Facebook. For more information about TOMS shoes, visit tomsshoes.com.